Choosing the right product for you in a sea of fish finders can be quite the task. It's often hard to know what to look for exactly. To make the decision an easier one, we've put together a list which will save everyone precious time, time that's better spent out on the water. Lots of people tend to argue over their favorite device and create confusion, but our reviews will set the record state. In any case, you should start by setting a budget which will narrow down your search. We're not in the business of pushing products; we're here to give a clear and honest overview of the best fish finders on the market. If you're still not sure about what you want to spend your hard earned money on after reading our reviews, we recommend that you take the time to do research on your own. 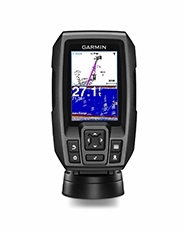 The Garmin Striker 4 is fish finder GPS that won't strain your budget but offers great features. This unit comes with CHIRP sonar technology that works with dual frequencies. It uses a 77/200 kHz transducer, but the control unit works with a 50/200 kHz transducer as well. This device identifies and separates fish targets with high-definition. It also gives a good view of the bottom structure and doesn't have too much clutter on the screen when displaying results. The Striker 4 also has 2D sonar with many useful features. Features included are Fish Symbol ID, alarms, A-Scope, and Auto gain. With GPS built-in, you can track your speed and location, mark waypoints, and points of interest. The screen on this unit is top notch. 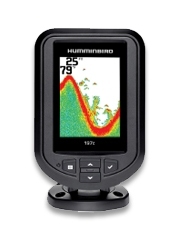 It comes in at 3.5 inches with a resolution of 480V x 320H, HVGA color and is backlit for clear viewing of sonar data. Innovative in design, the Deeper Smart fish finder leaves a great impression when reviewed. This ultra-portable wireless fish finder is perfect for fishermen who are on the go. It can reach places that traditional devices cannot. This wireless fish finder sonar works with dual beams of 90/290 kHz using 55° and 5° beams. Readings go down to 130 feet, and the width is up to around 16 feet. The two frequencies combined give lots of useful information by scanning a wider and a narrower area each time you cast-off this device. This unit uses smartphones and tablets that run on Android or iOS and comes with a feature-filled mobile app. That means you can use a big phone screen to view sonar results. With added options, you can check detailed weather reports, set depth and fish alarms, take advantage of social media integration, and more. For people who need a powerful unit, and don't mind spending a little extra, there's the Helix 7 DI GPS fish finder. 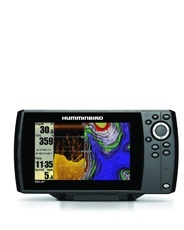 This product is one of Humminbird's more powerful models aimed at amateurs and pros alike. It comes equipped with an impressive 7-inch color display and LED backlight. This combination helps show images of impressive quality. This Helix 7 has Down Imaging and 2D Dual Beam sonar. These features provide a detailed picture of what's underneath the surface and your boat. 2D sonar works with 200/455 kHz and Down Imaging with 455/800 kHz. The depth capability with DI is 350 feet, and in standard mode, it's up to 600 feet. GPS comes built into this fish finder and offers a range of functions. You can take advantage of various map software, but also have pre-installed maps of U.S. and Canadian rivers, lakes, and coastlines. 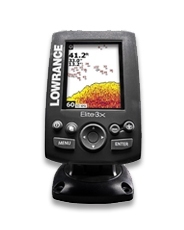 With a price that won't empty out your wallet, the Elite 3X fish finder has a lot going on. This unit made by renowned producer Lowrance. It has an 83/200 kHz transducer and a few nice features which got it into our top 5. The transducer uses two frequencies to collect underwater information. That way it gives better coverage of the bottom, various structures, fish, and vegetation. One transducer beam operates at 83 kHz with a 60° cone to scan larger areas. In comparison, the other, narrower 20° beam uses a frequency of 200 kHz for lure and fish tracking. As a bonus, there's a water temperature sensor built into the transducer. For the price, the color screen in this device is a great touch. It comes with a resolution of 320 x 240 with good viewing angles and LED back-light. Besides that, you get a quick release mount and transom mount for your transducer. The PiranhaMax 197C fish finder is in our top 5 for more than one reason. It comes with a price tag that's affordable and has a nice set of features, too. This product can be ideal for a small freshwater boat or kayak because of its size. It's made with a dual beam sonar and equipped with a 3.5-inch color display that's back-lit with a LED. The screen is bright and reads well at night or when it's sunny outside. The Dual Beam sonar works with 200/455 kHz frequencies and the Fish ID+ features for better identification of targets. For fishermen who don't need unique features or things like GPS and maps, this could be a good choice. The PiranhaMax 197C is affordable and straightforward to use. Unlike other units in this price range, it comes with a color screen. This product has our recommendation. Often a fish finder can be quite an unwieldy device. Many products come with different parts which can make setting them up and taking them off a real hassle. On the other hand, portable fish finders are very easy to carry around. When installed, they are self-contained, they run on batteries, and the transducer is attached to a suction cup. That way you can start finding fish in a matter of minutes. Portable fish finders usually consist of a few pieces which make them stand out. But, using two different parts doesn't mean that you have to sacrifice quality or space. This is possible with systems that have quick attaching mechanisms. That way you can connect devices with head units or ones that come with a separate transducer. Some transducers even attach to the end of your fishing rod and go underwater. Portable fish finders sometimes need to be connected to the bottom of your boat. But, even if that's the case, you can do it with an attachment system that doesn't require screws or drilling of the hull. This way of installing fish finders is ideal if you don't own your boat or don't want to damage your vessel. Having a fish finder with GPS can make a huge difference. If your fishing trips are on big lakes, for example, and getting lost is easy, then you'll be glad to have a way to know your exact location. Besides that, with a GPS fish finder, you'll be able to keep track of all your favorite places to fish at. First of all, you should take a look at what kind of maps come with the device you want to buy. Maps come in different forms, but all in all, they let you know where you are and where you're going. Another important thing to consider is getting a GPS fish finder which offers upgrades and updates to its software. One more thing to be aware of is a unit's accuracy. You will want to know where you are within a dozen or so feet. Finally, a GPS-ready device is going to be either internal or external in its form. If you buy one that has an external unit, you will need to attach it to your boat. Attachment can be a problem if you own a smaller boat or need a portable fish finder which doesn't need installation. When it comes to making a kayak fish finder, manufacturers take into account specific conditions. One of which is a profound lack of space in comparison to a regular boat. A person who is in the market for kayak fish finders needs a light, waterproof and sturdy unit. These help to find fish without leaving owners worried about damaging their device. A kayak fish finder also needs to be light, so it doesn't make rowing harder. One more thing to consider is choosing a device that will mount on your kayak with ease, a device that doesn't need external parts. With such a small vessel, a transducer made for installation on the outside can cause problems. Another thing to think about is whether you will need GPS. Getting lost on a kayak can happen to anyone in large bodies of water or unfamiliar places. That's why knowing your exact location and where you are going can make a huge difference. After all, you are relying on your strength when out fishing in a kayak. When in a kayak staying on course is crucial; you won't be able to start a motor when you get tired. Although many anglers and fishermen know about fish finders or have used them, not everyone understands how they exactly work. They are somewhat complicated devices. But knowing the basics of how they operate will help you use them with greater success. Money can buy the best fish finders, but you will need to invest some time as well if you want to learn how to use them the right way. That's why we have put together this article. We want to show you how you how a fish finder works and get you acquainted with the most important parts. The transducer on a fish finder is what does most of the work. The transducer sends out reads sonar waves. That way it determines the size, shape and distance of various objects in the water as these waves bounce off of them. Transducers create sonar waves with a crystal that vibrates under electrical current. These vibrations produce sound waves. You can find a few different types of transducers in fish finders that all have pros and cons to them. The application of a fish finder determines the type of transducer you will need. The other critical component to every fish finder is the display. You will be spending much of your time looking at and interacting with it. What information the transducer collects, the display will be showing. When it comes to screens on fish finders, there's a huge variety. While some are only in black and white, other fish finders come with full-color displays. A full-color screen can give you a refresh rate of up 30 frames per second and a full HD resolution. Some units show gathered information in a rudimentary form, as lines or arches. Other advanced devices use recognizable icons to display different kinds of objects. If you want to choose the best fish finder for you, there're a few things you should do. First of all, you need to know what you are looking for. Most fish finders come with a few essential parts. Learning the basics of how these different parts work separately and together is crucial. With a basic understanding of how these components operate, you can then take advantage of all our reviews. That way you will avoid buying something that doesn't suit your needs. Fish finders can come in a variety of different specifications. Some have basic features while others have many advanced ones. Some fish finders are for professional use, while others are entry-level devices aimed at people who want to try the technology out. Most importantly of all, the price can vary to a great extent. That's why you should arm yourself with knowledge before spending your hard earned money.